JOIN ME IN RAISING THE CONSCIOUSNESS OF THE NATION AGAINST THE LEGACY OF FATHERLESSNESS. Why this CD - Why this Urgent Message! This CD is a National CALL TO ACTION for all MEN and WOMEN everywhere with or without a child. Please forward and share this message with anyone who is struggling with parenting or who has a desire to be a better parent, nurturer or mentor. H. LaVance Hammonds, tackles the topic of a perpetuating legacy that is crippling this nation and aboard. He address a critical social issue in our community. This profound national crises is simple ... ... the need for "Men to be Responsible, Involved and Committed Male Nurturing Parents." LaVance speaks passionately about raising the national consciousness to trigger an emotional outcry around this topic. He believe responsible Fathers can be gracious without being weak, courageous without being insipid and strong without being overbearing. 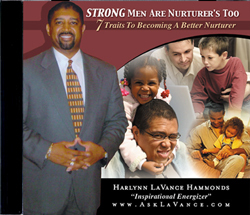 LaVance knows each child can aspire to live a life beyond "the street". From experience, he knows every child needs a Dad they can count on. What effect does growing up fatherlessness have on a child's development? The price of Fatherlessness is a rude awakening. Fatherlessness is the engine that drives our most pressing social problems. The magnitude of the situation is mindblowing. A child who is not nurtured is a child who never learns to trust, never develops empathy, never accepts responsibility for his or her behavior and hurts others with impunity. MEN ... we have the option "To Be or Not To Be"
Together, we have a responsibility to brake the cycle of the Fatherlessness! When we exemplify the seven nurturing traits highlighted in this CD, children lives will be enriched by our humble actions, guidance and leadership. Get this CD for yourself or sow it as a seed to help make an impact. WOMEN ... it is your role to help create a more "father friendly" environment. Get and share this CD with your husbands, brothers and uncles or any other males who can benefit from listening to this CD. Until we tackle this Fatherless problem, our children and societies will continue to suffer. If you think like I do, you believe children can benefit from the involved presence of a father in their lives.